This is the best compact crossover SUV for you wanted the RAV4 to become more adventurous. Toyota’s popular “Recreational Activity Vehicle (with) 4-Wheel Drive” has been a household name for more than two decades, with a well-deserved reputation for versatility and reliability, if not driving excitement. With an all-new RAV4 due for model-year 2019, Toyota juices the lame-duck 2018 lineup by adding the off-road-themed Adventure model. It has slightly brawnier styling and a smidge more ground clearance, but stops well short of a go-anywhere rock crawler. The Adventure slots into the middle of the lineup, and along with select other RAV4 grades is available with heated cloth front seats. Heated seats had been limited to versions equipped with Toyota’s “SofTex” leatherette upholstery (no RAV4 offers genuine leather, not even the top-of-the-line Platinum). The 2018 Toyota RAV4 is part of the crossover’s fourth design generation, which bowed for model-year 2013. Its styling was refreshed for 2016, and a gas/electric hybrid variant was added, creating one of the most fuel-efficient crossovers of any type. For model-year ’17, Toyota took the crossover further upscale with introduction of the flagship Platinum trim and upgraded safety across the board by making a suite of driver-assistance features standard on every RAV4. RAV4 is in a constant tussle with the Nissan Rogue and Honda CR-V for compact-crossover sales supremacy. With sales up 17 percent. It was No. 1 through the first eight months of 2017, followed closely by the Rogue and CR-V, which registered year-over-year increases of 20 and 8 percent, respectively. The class as a whole was up 3.2 percent. The order could change, but we expect each of the three to top 350,000 units sold for the year. That would mean this trio alone would account for more than 6 percent of all vehicles sold in the United States. That’s how strong the compact-crossover market is. Should you buy a 2018 or wait for the ’19? Buy a 2018 if you need a competent compact crossover now. It’s roomy, the styling doesn’t seem dated, safety features are laudable, and Toyota tends to heavily incentivize the RAV4. Discounts should get even more tempting as the ’18 model year winds down and dealers begin clearing inventory for the redesigned 2019 version. Wait for it if you fancy completely new styling, likely more power with even greater fuel efficiency, and expanded features. Meanwhile, the 2018 RAV4 again offers gasoline-only and gas/electric hybrid variants. Gas-only models come in six levels of trim: base LE, volume-selling XLE, the new Adventure; sport-themed SE; uplevel Limited; and flagship Platinum. All come standard with front-wheel drive. Traction-enhancing all-wheel drive (AWD) is a $700 option on the Adventure and $1,400 on the other trims. The 2018 RAV4 Hybrid is available in LE Plus, XLE, SE, and Limited trim — and only with AWD. While the gas-only models use an AWD system that employs a driveshaft and rear differential to send power to the back wheels as needed, the hybrid has two electric motors. One assists the gas engine driving the front wheels, a second independent motor drives the rear wheels when needed to maintain traction. Styling: “Ruby Flare Pearl” joins the list of paint colors as a $395 option for all 2018 RAV4 models. Otherwise, the Adventure accounts for the 2018 RAV4’s styling changes. It has exclusive 18-inch black alloy wheels; flared fenders; and black headlight bezels, fog-light surrounds, and roof-rack elements. Inside, it gets carbon-fiber-style trim, a leather-wrapped shift knob, special door-sill protectors, and all-weather floor and cargo mats with the Adventure logo. The Adventure’s underbody is fortified by light-duty skid plates and its suspension is raised about a half inch to created 6.5 inches of ground clearance. That’s sufficient for gravel paths and very shallow streams. If your wanderlust extends further, look at the off-road leaders in this class, the Jeep Cherokee and Subaru Forester, each of which has a more capable AWD system and boasts 8.7 inches of ground clearance. The rest of the RAV4 line retains the look that came on line with the model-year 2016 freshening. Dimensions and basic body shape were unchanged, but Toyota added a more-aggressive front fascia and a shapelier rear end. The SE version rides a firmer, lowered suspension, but that’s the extent of its sportiness. Platinum models have lower-body trim painted to match the exterior color, and an interior spruced up with unique accent pieces. All RAV4 models boast impressive passenger and with 38.4 cubic feet behind the rear seat and 73.6 with it folded, more cargo room than some midsize-class crossovers. Hybrids reduce that to 35.6 and 70.6, respectively, owing to a raised section of the cargo floor that accommodates the aft electric motor – and also makes loading bulky items a bit more awkward. Mechanical: No changes, aside from the aforementioned suspension alterations to the Adventure. Front-wheel-drive Adventure models get a limited-slip differential not available on other RAV4s, but AWD versions share the same setup as the other gas-only AWD versions. Like the SE, Limited, and Platinum, the Adventure has 18-inch aluminum wheels. The LE and XLE have 17s and sacrifice some initial steering response and maximum grip in turns for slightly better ride quality. Toyota has worked to sharpen the RAV4’s road manners, and the ‘18s are capable and confident, if not in league with the segment’s handling leaders, the CR-V and Mazda CX-5. 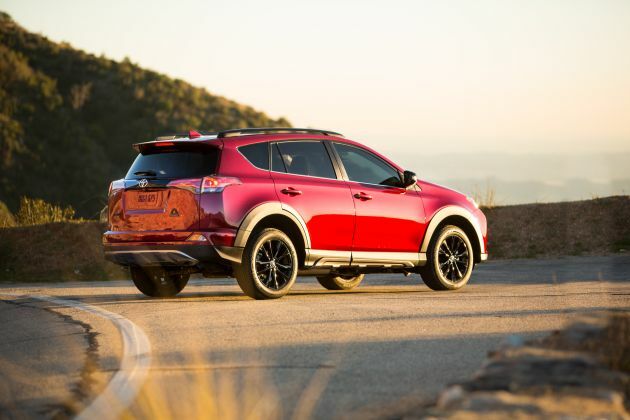 The gas-only RAV4s reprise a 2.5-liter four-cylinder engine with 175 horsepower and 172 pound-feet of torque. The sole transmission is a 6-speed automatic. That’s middling output for the class, so no surprise the result is middling acceleration, accompanied unfortunately by a cacophony of engine noise. It costs more and has slightly less cargo volume, but the RAV4 Hybrid is our choice as the best-driving entry in this lineup. It has a 2.5-liter gasoline four-cylinder, too, but teams with a battery-powered electric motor to help drive the front wheels while another motor provides AWD as needed. Total system output is 194 horsepower and 206 pound-feet of torque. The Hybrid uses a continuously variable automatic transmission (CVT), which eschews stepped gears for a rheostat-like power delivery. Hybrid RAV4s weigh some 300 pounds more than the gas-only versions and, on paper, have only marginally quicker acceleration. On the road, though, the instantaneous torque from the electric motor makes them feel smoother and stronger in all driving situations. The extra weight from the battery pack also helps lower their center of gravity, for increased stability in corners and in gusty crosswinds. Features: The XLE is available for the first time with heated front seats; they’re an $880 option. The Adventure is available with a new-to-the-RAV4 Cold Weather Package, a $1,060 option that contains heated power front seats, a heated steering wheel and a windshield-wiper de-icer. Heated front seats remain standard on SE models and above, with a heated steering wheel included on the Platinum. The Adventure also has a power outlet in the cargo area and an available trailering package that allows a towing capacity of 2,900 pounds in front-drive models and 3,500 pounds with AWD. All 2018 RAV4 models come standard with “Toyota Safety Sense-P” (TSS-P), which includes autonomous emergency braking with pedestrian detection; lane-departure warning with self-correcting steering; automatic high-beam headlight control; and radar cruise control that can maintain a set following distance from traffic ahead. These driver assists, along with an “Acceptable” score for headlight performance, allowed the 2017 RAV4 to achieve “Top Safety Pick+” status from the Insurance Institute for Highway Safety. Oddly, though, blind-spot and rear cross-traffic detection are not a part of TSS-P. They are standard on all Hybrids and on the gas-only Limited and Platinum. And they’re included as part of “Extra Value” or “Convenience” option packages that range in price from $610-$1,995 on the XLE, Adventure, SE, and their Hybrid counterparts. Blind-spot and rear cross-traffic detection are unavailable on the LE. Bluetooth connectivity, a rearview camera, and Toyota’s Entune infotainment system are also standard across the board. XLE and higher grades (Hybrid included) have dual-zone automatic climate control and a power sunroof. Heated front seats and steering-wheel paddle shifters are standard on the SE. Limiteds get a power driver seat with memory positioning, LED headlights, and imbedded GPS navigation. The Platinum adds a surround-view camera, heated steering wheel, and a hands-free power rear liftgate. Hybrid models largely mirror their conventional siblings in terms of standard and optional equipment. With the redesigned 2019 model in the wings and an eye toward inventory reduction, Toyota is holding the line on RAV4 pricing for 2018. Bottom-line price does rise slightly thanks to an increase in the manufacturer destination fee, which bumps to $995 from, $940. Destination fees are included in base prices listed here, and note that the fee may vary depending on the part of the country because some Toyota regions are served by independent distributors. With front-wheel drive, the gas-only 2018 RAV4 LE starts at $25,405; the XLE at $26,495; and the Adventure at $27,700. Base price with front-wheel drive is $29,785 for the SE, $31,900 for the Limited, and $34,750 for the Platinum. All-wheel drive adds $700 to the Adventure model, $1,400 to the other gas-only RAV4s. The 2018 RAV4 Hybrid starts at $30,025 for the XLE, $33,180 for the SE, and $35,025 for the Limited. Factory options for the LE are limited to an upgraded infotainment system with a 6.1-inch touchscreen and support for GPS mapping via a smartphone app ($675), roof rails ($190), and a cargo cover ($90). The conventional XLE offers Extra Value Packages in “Plus” ($800), “Power Plus” ($1,215), and “Power Premium” ($1,740) variants. The former adds upgraded infotainment with 6.1-inch touchscreen, blind-spot alert, rear cross-traffic detection, and keyless access with pushbutton ignition. Power Plus includes all this plus a height-adjustable power rear liftgate. Power Premium is everything in Power Plus, along with imbedded GPS navigation without the need for a smartphone and a 7-inch touchscreen display. Front- and rear-obstacle detection ($500) and heated front seats ($880) are standalone options. Adventure versions are available with the same Plus, Power Plus, and Power Premium Extra Value Packages as the XLE, but they cost $610, $1,025, and $1,550, respectively. Front- and rear-obstacle detection is optional here as well, at $500. The SE offers a Power Extra Value Package for $1,010 that includes the same equipment as the XLE/Adventure Power Plus group. Imbedded navigation is available as either a standalone option for $1,310 or as part of the Advanced Technology Package ($2,460) that also includes front- and rear-obstacle detection, and surround-view camera. For $600, you can have the SE’s front and rear lower bumpers, rocker panels, and fenders painted in silver. Limited option packages mirror those of the SE, but its built-in navigation system costs $785, while its Technology Package is $1,935. A hands-free power liftgate is an extra $300. Platinum options are limited to dealer-installed accessories. Hybrid options work slightly differently. The XLE offers imbedded navigation ($525), height-adjustable power liftgate ($415), and heated front seats ($880) as standalone items. The $1,905 Convenience Package includes navigation and power liftgate along with blind-spot and rear cross-traffic alert, and front- and rear-obstacle detection. Built-in navigation is $1,310 on the SE Hybrid and is part of the $2,785 Advanced Technology Package that adds surround-view camera and obstacle detection. These same features cost $785 and $1,435, respectively, on the Limited Hybrid. It’s pricier than many comparably equipped rivals, but our pick of the RAV4 lineup is the Hybrid XLE with Convenience Package, which will sticker for $31,930 or $32,810 if you add heated front seats (recommended for colder climates). This model drives the best and is the most fuel efficient as well. Stiff competition and generous incentives that can include no-interest financing for up to six years mean that such a RAV4 might be more affordable than you think. EPA ratings for gas-only RAV4s are roughly midpack for compact crossovers. Front-drive LE and XLE models rate 23/30/26 mpg city/highway/combined. The other front-drive versions rate 23/29/25 mpg. With AWD, the gas-only LE and XLE rate 22/28/25 mpg and the SE, Limited, and Platinum rate 22/28/24. All Hybrid versions rate 34/30/32 mpg city/highway/combined, tops overall among all crossovers, bar the far more expensive plug-in-hybrid Volvo XC60 and XC90. Note that the RAV4 Hybrid’s city fuel economy is its most efficient rating, reflecting the hybrid’s ability to maximize electric assist at low speeds. RAV4 uses regular-grade 87-octane gasoline. The redesigned 2019 RAV4 will have freshened styling, updated drivetrains, and a new underskin architecture derived from the company’s 2018 Camry sedan and CH-R subcompact crossover. We expect it to weigh less than the outgoing model, but it will probably have more power, likely in the realm of 200 horsepower and 185 pound-feet of torque. It will also likely ditch its 6-speed automatic transmission in favor of an 8- or even 10-speed gearbox. These upgrades should see RAV4’s acceleration improve by at least 15-20 percent while fuel economy could increase proportionally. The RAV4 Hybrid will likely return as well, but it’s unclear as to what form its drivetrain will take. Ford Escape, though available with more power than the RAV4, this crossover is less roomy and refined. Jeep Cherokee, which is more capable off-road, but has far less cargo room and is saddled with a reputation for unreliability. Hyundai Tucson, which is slightly more fun to drive, but its available turbocharged engine and dual-clutch automatic transmission can be aggravating to drive in heavy traffic. Honda CR-V, which is just as roomy, but is faster and more fuel efficient than the RAV4. Mazda CX-5, which leads the class for driving enjoyment. Subaru Forester, which feels even roomier and is available with a potent turbocharged engine, all for similar or less money.